Urban village is a spatial solution for the problems of capitalist accumulation in Chinese cities. When the city of Shenzhen first rose to become the center of manufacturing industries in the global market in the 1980s, urban villages proliferated to provide cheap informal housing to the numerous migrants, so the industries could remain competitive. When over-accumulated capital found its way into the real estate market and made Shenzhen one of the most expensive cities to live in China in the 2000s, urban villages were an easy target for land expropriation because of their relatively lower prices. As the urbanization process now continues, Shenzhen has been incorporated into the country’s ambitious plan for constructing the Guangdong-Hong Kong-Macao Greater Bay Area, or dawanqu. Urban villages, once again, are positioned at the forefront of the new urban developmental plan. Since November of 2018, the city government of Shenzhen has shifted its strategies for urban villages from demolition to preservation. 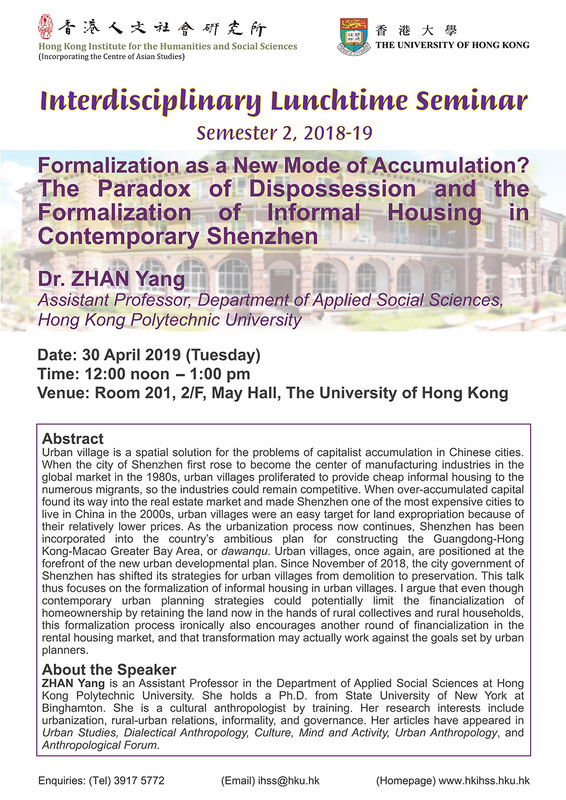 This talk thus focuses on the formalization of informal housing in urban villages. I argue that even though contemporary urban planning strategies could potentially limit the financialization of homeownership by retaining the land now in the hands of rural collectives and rural households, this formalization process ironically also encourages another round of financialization in the rental housing market, and that transformation may actually work against the goals set by urban planners. Zhan Yang is an Assistant Professor in the Department of Applied Social Sciences at Hong Kong Polytechnic University. She holds a Ph.D. from State University of New York at Binghamton. She is a cultural anthropologist by training. Her research interests include urbanization, rural-urban relations, informality, and governance. Her articles have appeared in Urban Studies, Dialectical Anthropology, Culture, Mind and Activity, Urban Anthropology, and Anthropological Forum.